Two articles came to my attention this week and I want to share them with you. The author of the first article, Christine Nelson, lives in central New Hampshire. I met her when I lived there and she is a lovely, observant woman who works hard in her community for Relay for Life. She often writes for the InterTown Record, a local weekly paper to which John and I subscribe. She wrote the lyrical piece that follows and has given me permission to reprint the article here with her name and e-mail address. Please drop her a line — she’d love to hear from you! Her article appears in the Tuesday, June 1, 2010 edition of the paper on page 17. The week while driving our roads, I have encountered a number of turtles making a move to cross the road. It occurs to me that they are not happy on the plush side of the road they are leaving. 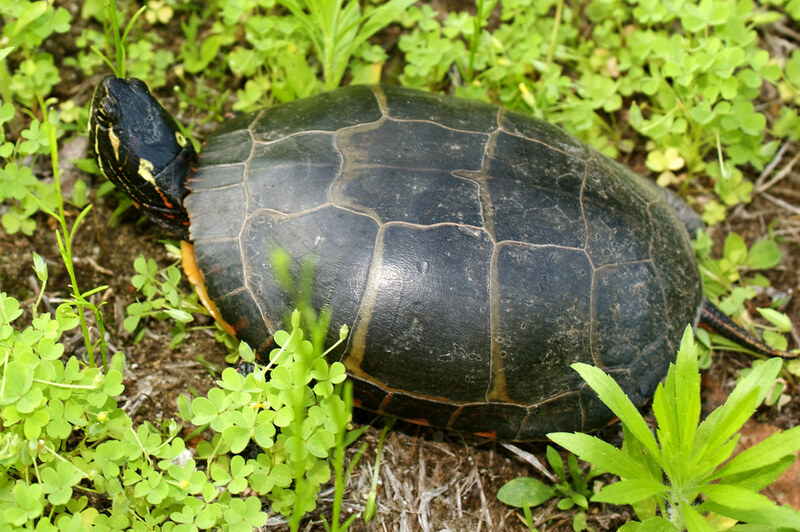 The one I saw most recently was the ever popular Eastern Painted Turtle (Chrysemys picta). The head is a deep shade of green with yellow stripes and one spot each directly behind the eye. The shell is smooth and criss-crossed with lines making uneven sections across the top. There seemed to be spots of red on the edges of the shell as well. 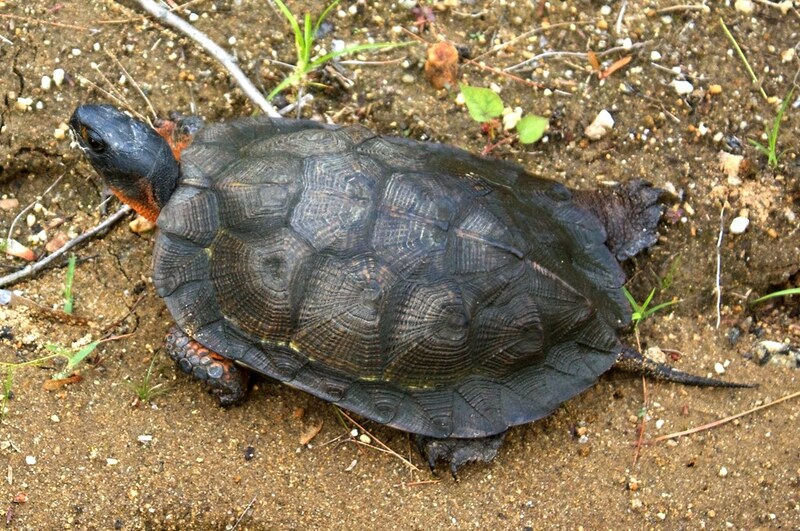 The State of New Hampshire lists this turtle as widespread across the state, with lesser populations in the northern parts of our state. The one I saw on my road was leaving the wetland area and headed to a nice sandy patch across the street in the woods. From my reading, and without having to “investigate further,” I deduced she was a mom looking to make a nest. She wasn’t too big, maybe about six inches in diameter, but she was making good speed in turtle inches per hour. I was concerned that she would get run over and decided to turn around and see what I could do to keep the road mortality number down and make sure she got across. To my horror, before I could turn around, a car came speeding up the road. Fortunately, the car passed right over her without crushing her. I was more determined then to help her finish her journey. I turned around, pulled just behind the determined mom-to-be, and flicked on the flashers of my car lights. I got out to watch her, remembering not to help her by touching her but just observe and protect. Me — the Turtle Police! As a car slowed down going past, I heard a child yell to the driver, “Look, Mommy, it’s a real turtle!” It’s nice to know the smaller things in life are still appreciated by the smaller humans. I leaned against the front of my car and noticed that there were “hitchhikers” on the back of mom’s shell. They looked like slugs. I felt the urge to “scrape” them off, but I resisted. A friend stopped and asked which species I was helping along this time. We had met some 20 years ago, with me doing just that after having moved here the year before. As the momma made her way to the woods and I made my way home, I wonder if she found a comfortable nesting area and if I will encounter her youngsters in the near future. Last spring in New Hampshire, John and I each rescued turtles — he rescued an Eastern Painted Turtle like Christine did, and I saved a wood turtle (click the links to read the articles). I don’t know if it is bad form to handle the turtles that you rescue. John and I brought them home to the ponds. And the naturalist I quote below actually notches the turtles he finds in order to identify them in future years. 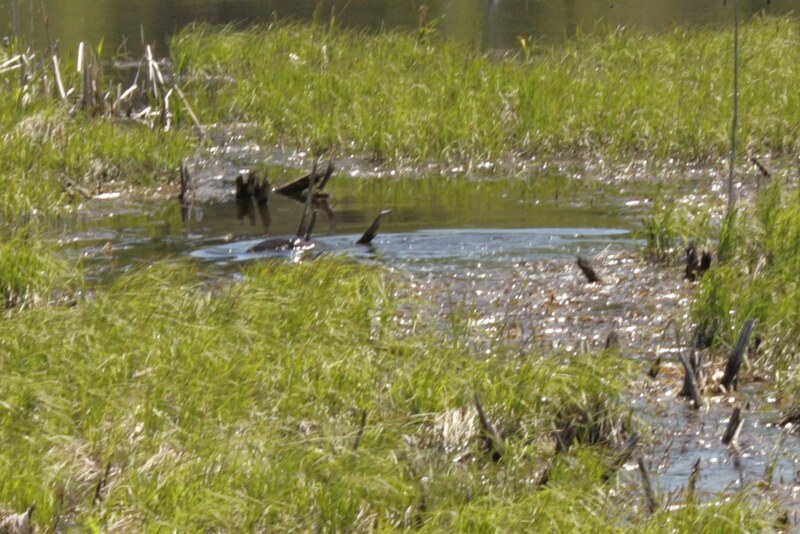 The photograph above is of one of the otters in our beaver bog. It was taken with my 18-55mm lens, so it is not a good photo. The next time an otter comes through here (they only pass through; they do not live here because otters and beaver do not coexist well), I will use my new lens to get real photos. I love otters. They are fun to watch. And they are cute. But there is a dark side . . . I raise my head and look upstream. Can I be looking at a wood turtle? The shape is far enough ahead that I cannot be certain, and my disbelief that a turtle would be so exposed, up on an open, muddy mound of stream bank, surrounded by snow and ice, prevents definite recognition. But as I advance I begin to read it as a turtle, and the reading is disturbing. The angle, something in the way that so-familiar sculpted shape is settled, is sharply out of keeping with any search-image I have. Wood turtles always place themselves in harmony with their surroundings, with the configurations of the earth or stream bottom on which they have settled or over which they move. This gestalt has struck me as unfailing. Except when they are compelled to cross a road or open law, wood turtles are never out of place. Even from some distance, as I wade, looking into the turtle’s face, I know that something is terribly wrong. Where is that light in the eyes, the light of life and reflected day that shows before the gold-ringed eyes themselves can be clearly seen? What are those shadows, dark pockets on either side of the jet black head? Where are the legs, black-scaled, with vivid flashes of red-orange skin color that should be part of the pattern? Riveted by this troubling vision, I never look away as my feet find their way over the streambed and I wade to the turtle. A profound confusion comes over me, the elation of seeing that first turtle up out of the water at the end of hibernation mingling with a reality I do not want to see. The turtle’s eyes are closed, her legs are gone. I pick her up. Her shell is so familiar, that shadowy umber brown carapace with yellow-gold striations, like faint flecks of sunlight. Tiny notches I have made along her marginal scutes identify her. An adult female, she is one of the wood turtles I have documented along this brook, where I have been recording them in notebooks over the past twenty years. Her head does not move, there is no sign of life in her tail as I move it from side to side. A few tiny bubbles appear at her nostrils, perhaps a last flicker of life. All of her right front leg is missing and the lower half of her left front. Her right hind leg has been eaten away from the knee joint down, and her left hind leg is only a shaft of bone to where the knee joint was. How did she get up here? My crowded thoughts and questions settle out, and I realize that of course she could not have climbed up onto this mound but was left here by the otter who discovered her in her winter-hold in the stream and wrestled her onto land to work at her, force out at least a foot to eat from the fortress of her shell. There is not one tooth mark on her carapace or plastron; predators know there is no biting through the shell of a wood turtle this size. A sense of foreboding comes over me, as it did five years ago when, at this same seasonal moment, I discovered an adult male who had lost both front legs and then a six-year-old who had been bitten through and killed. I am familiar with reports by others who study turtles of heavy losses on colonies of painted and snapping turtles by otters preying upon them during their hibernation. I found no further evidence of such predation that year, but I wonder what I will find when the wood turtles here begin their first streamside basking of this new season. I set the turtle back down. The temperature will drop well below freezing tonight. If the least flicker of life does remain within her, it will be extinguished. A life of decades, likely more than half a century, has come to an end. Borrowed stardust is at length returned, and the flame that burned within passed on. In silence, the water flows on by.